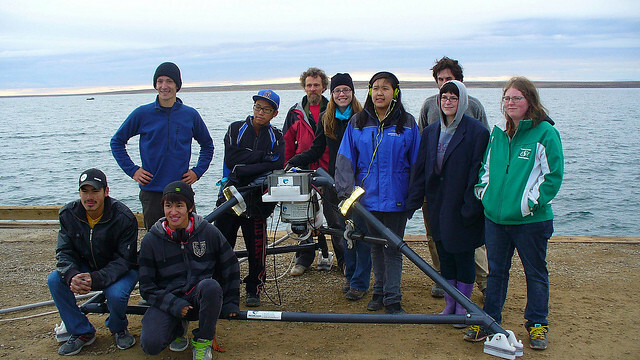 In August 2012, the Nunavut Research Institute granted a five-year research license to Ocean Networks Canada to install and operate the first year-round cabled undersea monitoring system of the northern waters. Following a two-month commissioning period, the miniature cabled ocean observatory and companion surface weather station are reporting continuous data to the archive system at the University of Victoria. The information streaming from the instruments—including an underwater camera, ice profiler and sensors measuring temperature, depth and salinity—is freely available over the internet. The graph below shows several parameters from one week of constant data from early December 2012. Plot #1 shows the temperature at the dock: it hovers around -30ºC. Plot #2 indicates the change of pressure with the tides, indicating that the ice still heaves. Plot #3 illustrates another unfamiliar site: negative water temperatures! Plot #4 shows the increase in ice thickness. Since it started to form, the ice layer appears to have grown at a regular average of approximately 1 cm per day. In the months ahead, education, science and operations staff will be working with Cambridge Bay schools to develop educational programs and support collaborative projects with the coastal Arctic research community.